Fly into Himalayas with Druk Air, Bhutan's National Air Carrier. The green walls of the hills known as dooars or gateways into Bhutan from the plains climbs continually higher as the plane flies north towards the Tibetan border. Silvery rivers thread the valleys, waterfalls plunge down the forested mountainsides, and to the north, the great snowcapped peaks of the inner Himalaya rise up into the sky. As the aircraft enters the Paro valley, look down and you will see the Paro Dzong overlooking Paro Chu (river) with Ta Dzong, watch tower, now the National Museum, above it. Received by our representative at the airport and after completion of airport formalities proceed to Thimphu . Just before arriving Thimphu, visit Buddha Point (Kuensel Phodrang). Located at a short drive from Thimphu city centre, visitors can get a good overview of the Thimphu valley from the Buddha point (Kuensel Phodrang). You can pay your obeisance and offer prayers to the Buddha, the largest statue in the country and then walk around and take a glimpse of the valley. Evening at Leisure in Thimphu. Start with a visit of National Library, which holds a vast collection of ancient Buddhist texts and manuscripts, some dating back several hundred years, as well as modern academic books mainly on Himalayan culture and religion. Also visit nearby Institute for Zorig Chusum: Commonly known as Arts & Crafts School or Painting School ( closed on Sat & Sun ) , the Institute offers a six-year course on the 13 traditional arts and crafts of Bhutan. On a visit, one can see students learning the various skills taught at the school. Followed by a visit to Simply Bhutan - an exclusive project under the Bhutan Youth Development Fund . It is a living Museum and Studio encapsulating the cultural heritage of the Bhutanese people. The infrastructure portrays ancient Bhutanese architecture which is being lost to modernization. Memorial Chorten: the beautiful stupa built in the memory of Bhutan's third King. The paintings and statues inside the monument provide a deep insight into Buddhist philosophy and Trashichhodzong; the beautiful fortress/monastery which houses Secretariat building, King's Throne room and other government's offices. It is also the summer residence of Chief Abbot. Also visit the Handicrafts Emporium - This government-run enterprise displays a wide range of beautifully hand-woven textiles and craft products. Dinner and overnight at the hotel in Thimphu. Morning after breakfast drive to Punakha across Dochula pass (3,O8Om). In Bhutan, the passes are marked by a large Bhutanese Chorten and prayer flag. Dochula pass offers the most spectacular view over the high peaks of the eastern Himalayas on a clear day. You can stop here briefly to take in the view and admire the chorten, mani wall, and prayer flags which decorate the highest point on the road. From Dochu-la pass, it is a long, winding descent into the Wangduephodrang valley, which is about 1,700m below the pass. Enroute sightseeing of : Sangchhen Dorji Lhuendrup Lhakhang nunnery: Perched on a ridge amid pine trees and overlooking valleys of Punakha and Wangduephodrang, gleams the magnificent structures of Sangchhen Dorji Lhuendrup Lhakhang(Temple). The temple houses a 14-foot main bronze statue of Avalokiteshvara (Chenrigzig chagtong chentong). Other statues include those of Guru Padmasambawa, Gautama Buddha, Zhabdrung Ngawang Namgyel, Tsela Namsum, the 21 Taras and Tsepamay (Buddha of longevity). The Avalokiteshvara statue, one of the biggest in the country, is the handiwork of entirely local Bhutanese artisans. Morning after breakfast a beautiful hike takes you to the regal Khamsum Yuelley Namgel Chorten, which was built to remove negative forces and promote peace, stability and harmony in the changing world. The Chorten dominates the upper Punakha Valley with commanding views across the Mo Chhu and up towards the mountainous peaks of Gasa and beyond. The proceed for a visit to the majestic Punakha Dzong built strategically at the junction of Pho Chhu and Mo Chhu rivers in 1637 by Shabdrung Ngawang Namgyal to serve as the religious and administrative centre of the region, Punakha Dzong has played an important role in Bhutan’s history. Damaged by four catastrophic fires and an earthquake, the Dzong has been fully restored by the present King. Later in the afternoon enjoy another excursion to Chimi Lakhang : situated on a hillock in the centre of the valley, is dedicated to Lama Drukpa Kuenley, who in the late 15th century used humour, songs and outrageous behaviour to dramatise his teachings and due to this also known as ‘Divine Madman’. This temple is also known as the temple of fertility. It is widely believed that couples who do not have children and wanting one, if they pray at this temple, they are usually blessed with a child very soon. It is about 30 minute walk across field from the road to the temple. The trail leads across rice fields to the tiny settlement of Pana, meaning ‘field’. It then follows a tiny stream downhill to Yoaka and across more fields before making a short climb to Chimi Lhakhang. Morning after breakfast drive to Paro . Enroute visit the Simtokha Dzong – the institute for Language and Cultural studies . Later in the afternoon in Paro visit Ta Dzong : once a watchtower, built to defend Rinpung Dzong during inter-valley wars of the 17th century, Ta Dzong was inaugurated as Bhutan's National Museum in 1968. 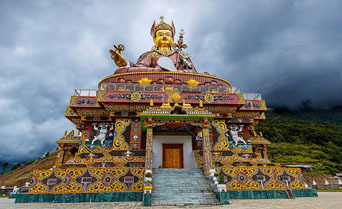 It holds fascinating collection of art, relics, religious thangkha paintings and Bhutan's exquisite postage stamps. The museum circular shape augments its varied collection displayed over several floors Afterwards, walk down a hillside trail to visit Rinpung Dzong, which has a long and fascinating history. Built in 1646 by Shabdrung Ngawang Namgyal , the first spiritual and temporal ruler of Bhutan, the Dzong houses the monastic body of Paro, the office of the Dzongda (district administrative head) and Thrimpon (judge) of Paro district. The approach to the Dzong is through a traditional covered bridge called Nemi Zam. A walk through the bridge, over a stone inlaid path, offers a good view of the architectural wonder of the Dzong as well as life around it. It is also the venue of Paro Tshechu, held once a year in the spring. Morning after breakfast - proceed for an excursion to Taktshang Lakhang ( 5hrs hike total ) : perched on the side of a cliff 900m above the Paro Valley floor , it is undoubtedly one of the most famous of Bhutan’s monasteries. Lore has it that Guru Rinpoche arrived here on the back of a tigress and meditated at this monastery thus the name ‘Tiger’s Nest’. This site has been recognized as a most sacred place and visited by Shabdrung Ngawang Namgyal in 1646 and now visited by all Bhutanese at least once in their lifetime. On 19 April, 1998, a fire severely damaged the main structure of building but now this Bhutanese jewel has been restored to its original splendour. Along the way back to the Hotel , visit the 7th century Kyichu Lhakhang, one of the 108 temples built in the Himalayas by Tibetan King, Songtsen Gampo. 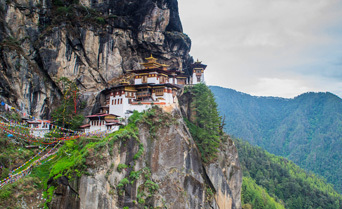 The building of this temple marks the introduction of Buddhism in Bhutan. 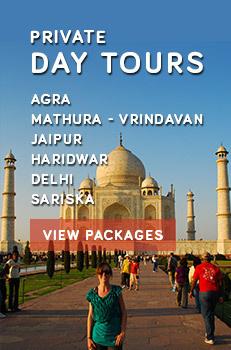 Fullday excursion to Haa Valley : Start the day early for drive to Haa via Chele-la pass. 4 Km away at Bondey village the road to Haa diverts towards the right hand side and the climb up towards the chele-la pass starts. After driving through blue pine & rhododendron forest for 45 km, reach Chele-la pass ( 4200 meters). From this point one can have a superb views of Mount. Chomolhari & Jichu Drakey. This is a very good place to walk around for few minutes enjoying the view. Drive on to Haa, descending all the way for another 22 km (under an hours drive), finally reaching Haa. The Haa Dzong is presently occupied by military, but the view from outside is stunning. After picnic lunch visit to the famous Monastery Lhakhang Karpo (White Temple) followed by visit to Lhakhang Nagpo (Black Temple). The central shrine in Lhakhang Nagpo is said to have no difference with that of Lhasa JOWO in Tibet. The construction of the Lakhang Karpo is believed to have been assisted by the locality. As a result the place came to be locally known as “Hay” meaning” surprise” which later became “Haa” due to the differences in interpretations and pronunciations of different people over time. The three giant hills looming over the fringes of Haa valley were called ”Me Rig Puen Sum” especially after the incidence of the Lhakhang Kdarpo construction. Today the three hills are popularly known as “Rig Sum Goenpa” signijfying three deities-Jambayang Chana Dorji and Chenrizig. Later, other Buddhist saints like Guru Rinpoche and “Machi Labdorn” came to the Jungney Drag in Haa and blessed the locality. The principal religion followed is Drukpa Kagyud. After breakfast transfer to the Airport for our onward journey.